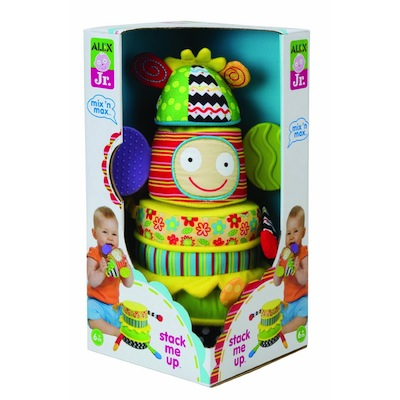 Mix 'n Max - Stack Me Up is a colorful, soft stacker - perfect for infants and toddlers. Stack the four soft pieces with hook and loop to create a mixed up Max! Includes squeaker, stretchy arm, teether ears and crinkly legs. Includes a variety of textures, patterns and colors. Helps to develop hand-eye coordination, fine motor skills and problem solving skills. May also be used as a teether, while increasing building skills. Ages 6 months and up.